Digesting the year's best new restaurants. After ending 2017 in a blur of purple sweet potato, cream cheese tea and Chinese theme bars, 2018 has been a breath of fresh life for Bangkok’s restaurant scene. 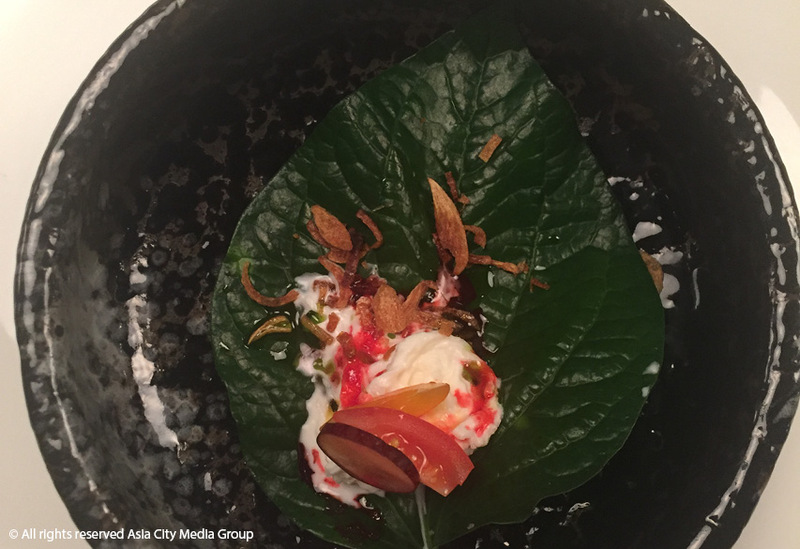 Out go gimmicky desserts, in come Thai tasting menus with the most exacting attention to produce and detail. 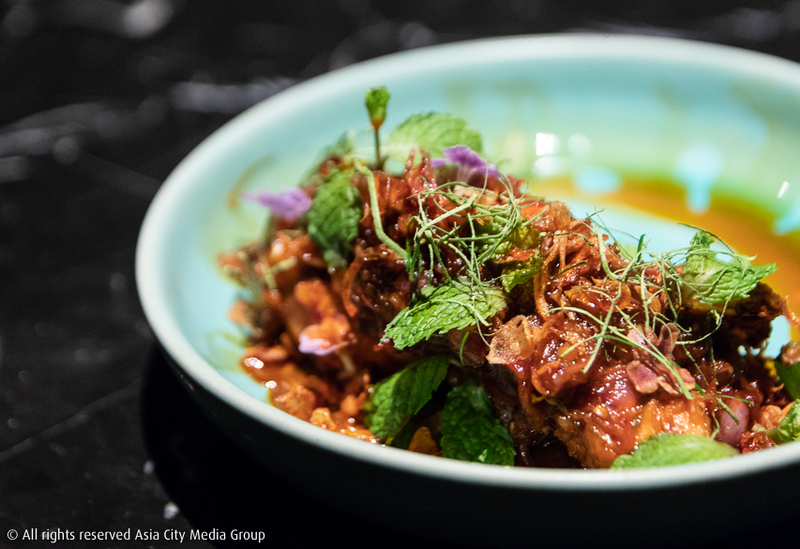 Call it the Michelin effect, or call it the work of an outstanding new collection of local chefs who are challenging the best international standards, but something about this year made the Bangkok food scene bring its A-game. Still, it wasn’t all about local fine dining and fancy tasting menus. International fast-food franchises, easygoing brunch joints and delicious pizza places all made this a year of eating to remember. How many have you visited? 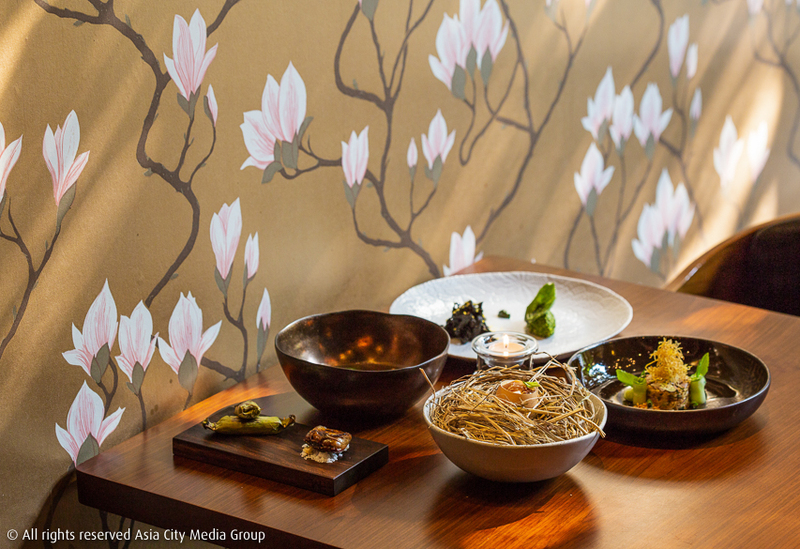 The eponymous globe-trotting celebrity chef’s Bangkok opening layers Korean and Japanese flavors with influences from his American upbringing. 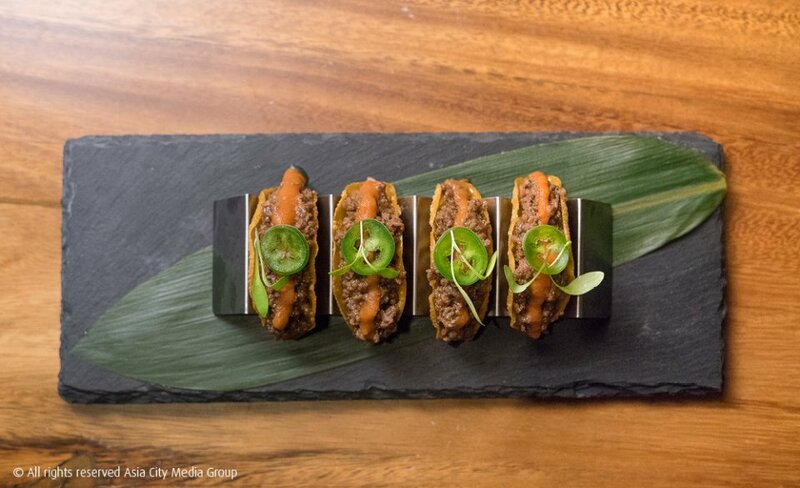 Share the AB tacos (crispy taco shells stuffed with wagyu bulgogi marinated in sweet soy sauce, B360) and tuna pizza (tuna sashimi on chip-like crust drizzled lightly with white truffle oil, B310) to keep room for the grilled octopus in smoked jalapeno sauce (B580). 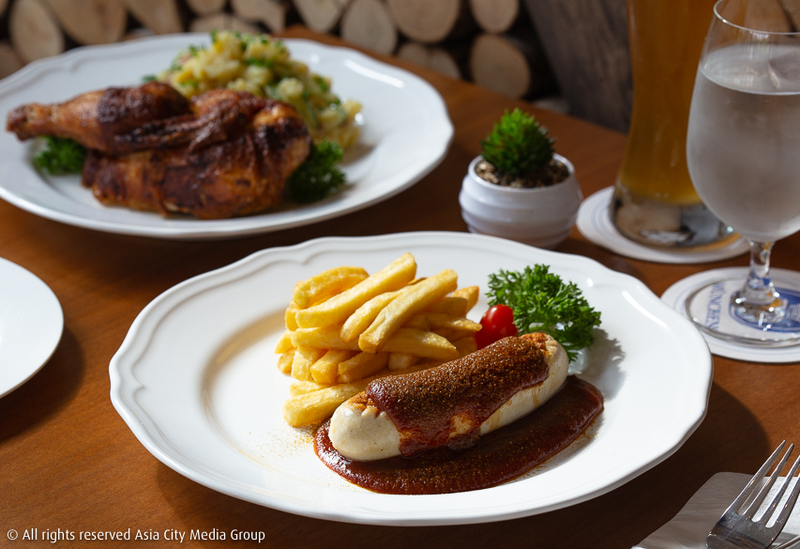 From the former manager of Bei Otto, this German eatery brings boisterous beer garden vibes to Ekkamai. Their homemade Nuremberg sausages (B320) feature spice blends flown in from Germany, while the pork knuckle (B520) is fried to crisp, crackling satisfaction—both are served with a slightly sweet dark beer gravy and mashed potatoes. You might know Billy Bautista from Osito Unique Spanish and La Monita. For his new venture, he’s taken on barbecue. Bautista cooks his beef brisket (B750) and short ribs (B1,200) the Texas way, coated only with salt and pepper and smoked for 20 hours using oak wood. There’s also Kansas-style ribs (B400-750), Mexican cornbread (B50) and smoked black cod with almond mole (B390). At Soi Yenakat’s French deli-meets-bistro the flavors are classic, the portions big and the produce everything. Start with trayfuls of plump, buttery snails (B590/12), wonderfully fresh oysters (B60-265) and slippery roast vegetables drenched in garlic olive oil (B320). Save room for the sloppy, perfectly seasoned steak tartare (B690) and hearty cassoulet (B790). 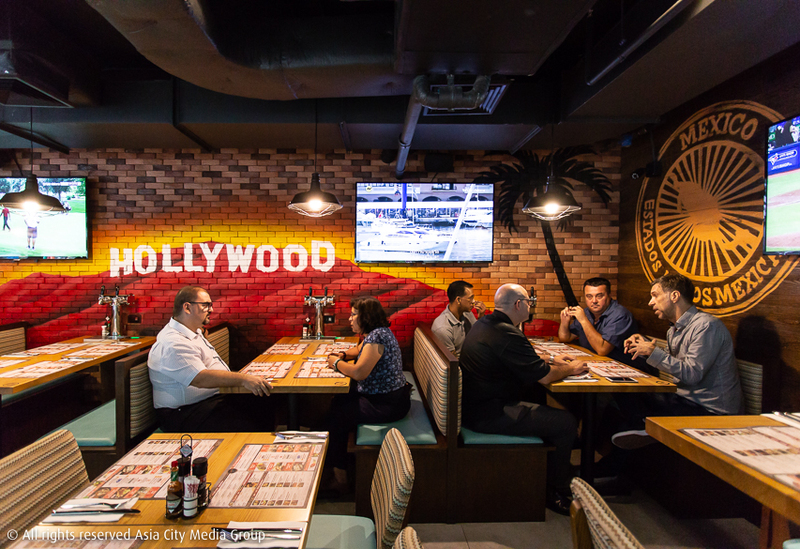 The Hong Kong-based food franchise offers a Californian take on traditional Mexican dishes. Sit in the comfort of a booth or opt for a street-facing bar stool to enjoy cheesy quesadillas stuffed with juicy pulled pork (B299) and beef tacos (B399/three pieces) topped with a crazy amount of cheese. Each table even comes with a beer tap for you to pour Singha (B0.26/ml) or Asahi (B0.30/ml). A second location has quickly followed on Silom. 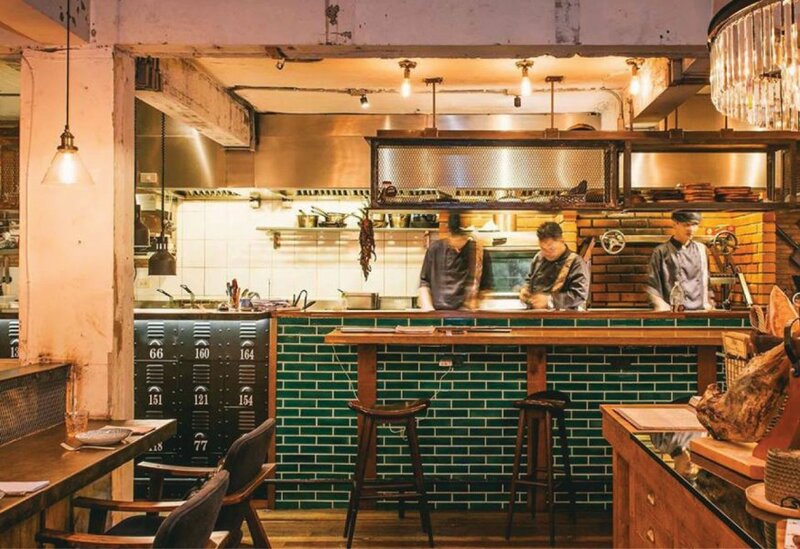 This new venture from the Rarb guys (who run Rattanakosin’s nose-to-tail Isaan specialist as well as burger joint Escapade) takes over the big open kitchen at Charoenkrung design complex Warehouse 30. Here, guests sit around one long communal table to feast on a menu of local ingredients that changes every 1-2 weeks. Don’t call it authentic Thai, although the flavors of dishes like a yam pla slid (snake skin fish spicy salad, B240) and ped pa lo (five spices duck, B140) served like duck confit with kombucha dipping sauce are unmistakably from the kingdom. Ekkamai’s cozy pizzeria is French-owned but has the pizza panache of Italy. These wood-fired pies are made with specially imported Italian flour matured for 72 hours yielding doughy and pliable results. 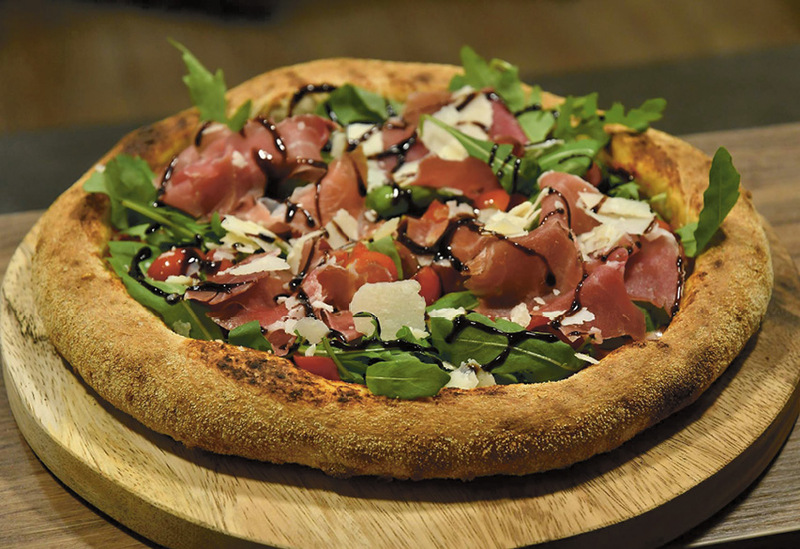 Let the billowy crust shine with the traditional margherita pizza (B350, 13 inch) or venture out with the Delices de Capoue (B630), whose layers of fresh cream, mozzarella, rocket, cherry tomatoes, pesto and ham won the praise of local Michelin-studded chef Jason Bailey (Paste). After 12 years in Denmark, chef Rungthiwa Chummongkhon (formerly of Copenhagen’s Michelin-starred Kokkedal Slot and Noma) has returned home to head the new Waldorf Astoria’s flagship restaurant. Her 10-course menu (B3,200) is local, seasonal, modern yet evocative of Nordic flavors. You can presently enjoy a local beef tartare, salmon with carrot juice and bitter orange and tooth fish in a smoky broth. 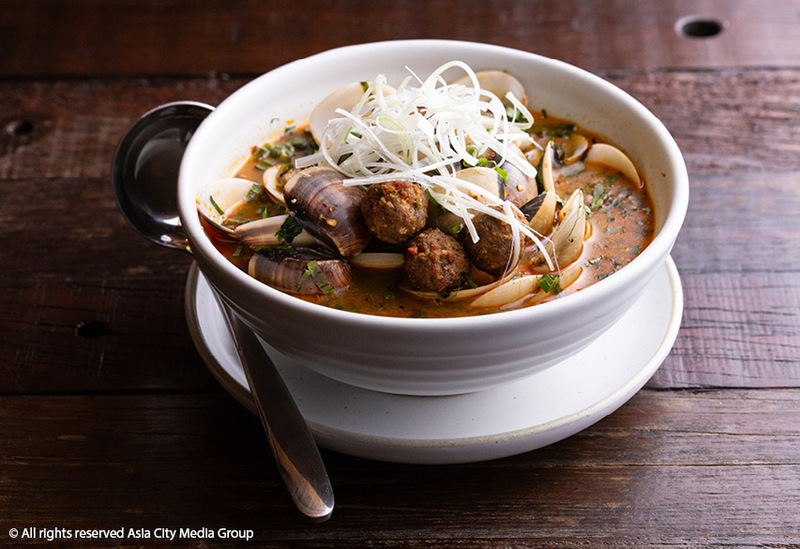 Full-flavored Lao recipes and an old-school funk soundtrack combine at the noir-industrial dining room of Sanya Souvanna Phouma (Bed Supperclub, Maggie Choo’s, Sing Sing and Cactus) and fellow Laotian business partner Saya Na Champassak. Dishes like kaipen (B190), a starter of fried Mekong river-weed served with three types of spicy dips like jaew bong, are drawn from the their Lao upbringing. The refreshing feu kra dook seen (B450) plays on Vietnamese pho and the French classic pot-au-feu that offers roasted bone marrow, sliced raw wagyu beef, herbs and loads of onions. This tempura omakase—a chef’s selection of premium deep-fried produce served around a sushi-style counter—restaurant is here thanks to the one-Michelin-star Ginza Sushi Ichi team, and like that restaurant, this one also hails from a seriously fancy mother branch in Tokyo. Enormous Hokkaido scallops, decadently rich Kobe beef and pockets of nori stuffed with creamy sea urchin get delicately fried in sunflower oil in head chef Kawaguchi Daiki’s B4,500-6,500 menus. The people behind Mama Dolores Pizza on leafy Yen Akat have opened this all-Mediterranean, all-vegetarian venture. The signature chickpea dip is elevated with tons of toppings and styles. 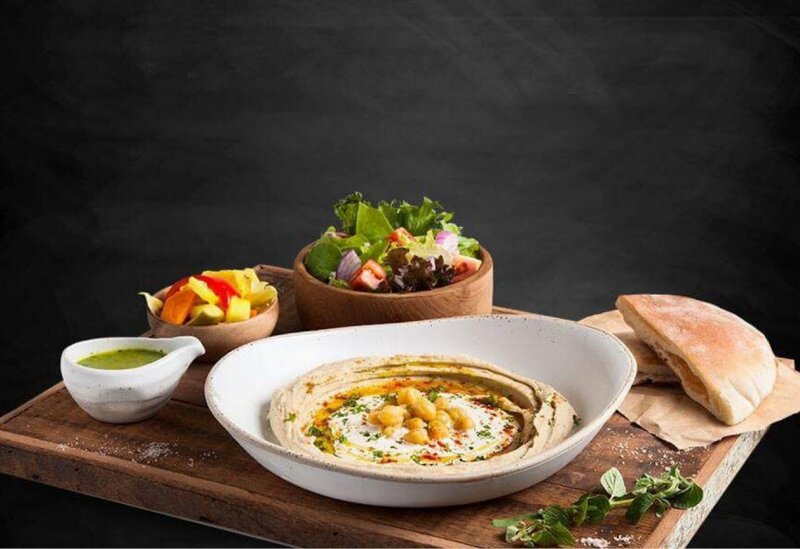 Try the Avocado Hummus (B280), which features avocado, rocket, egg, kalamata olives, almonds and balsamic over a bowl of creamy hummus.The more traditional Falafel Hummus (B220) combines crispy falafel with hummus and a chopped pickle salad. Stave off that Italian eatery ennui with this pizzeria, delicatessen, bakery and bar all in one. 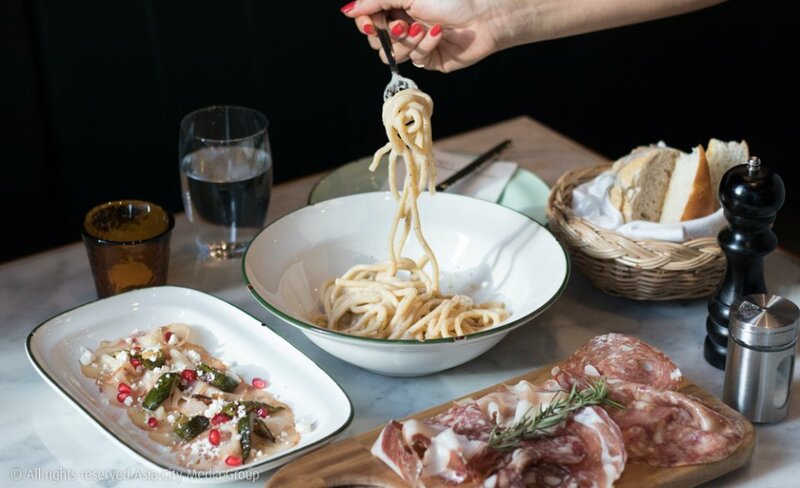 The menu won’t bore you either, skirting the likes of classic carbonara and spaghetti Bolognese for more esoteric, but still homey, eating from across Italy’s 20 regions. The orecchiette in a pork sausage and saffron sauce (B350) is a crowd pleaser that goes well with red wine. From local aromatherapy brand to cute cafe purveyor to full-blown diner, Karmakamet’s latest opening at the Lhong 1919 riverside Chinese complex comes with yet another new concept. 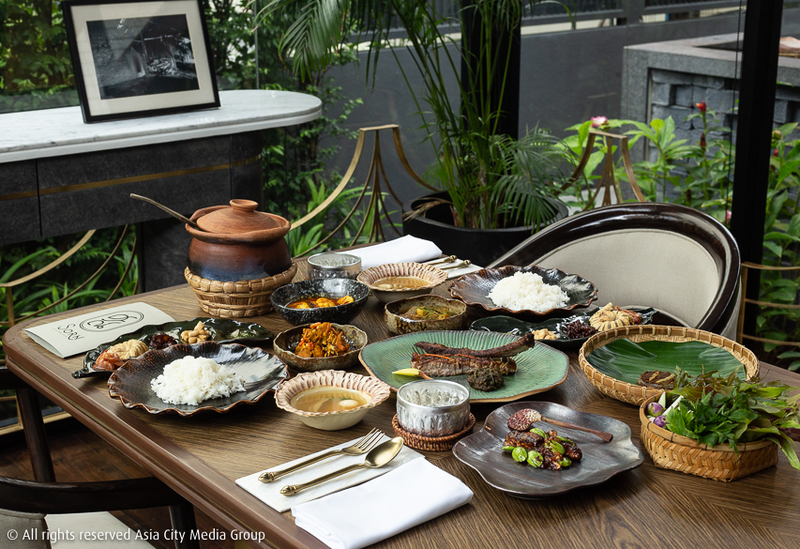 Karmakamet Conveyance goes for fine dining: minimal whites, gold accents, tables adorned with single white orchids, and head chef Jutamas Theantae’s seven-course menu (B2,500). Jutamas’ food journeys through Asia, from the Philippines-inspired pulled pork adobo in a light rice cake bun topped with roasted coconut and galangal, to the southern Thai spiced coconut crab with fried cempedak fruit. 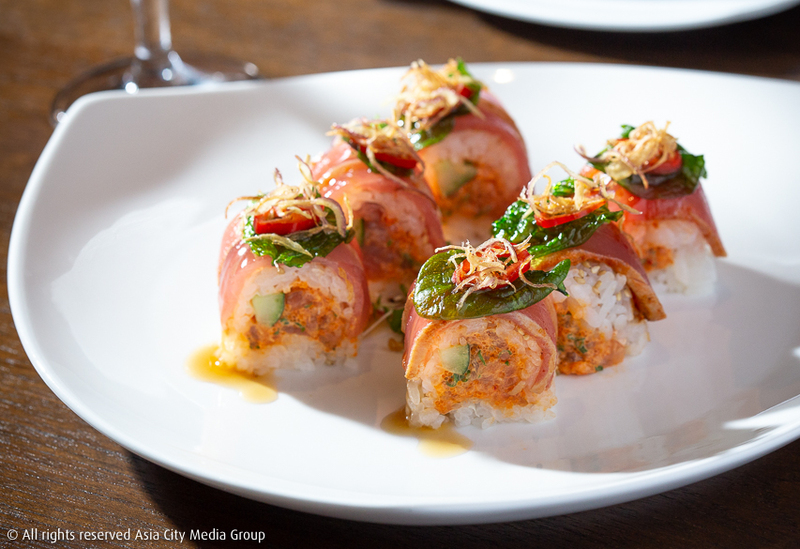 This swanky Japanese party lounge combines Koi restaurant and next-door hotspot, The Club by Koi. The California-born brand’s long, narrow space boasts a sultry ambience with leather upholstered seats and a deeply polished bar. Stop here to sip on a Lychee Rose Martini with fusion-y, Japanese comfort food like spicy tuna on crispy rice cakes (B450) or wagyu beef with mashed potatoes (B1,300). 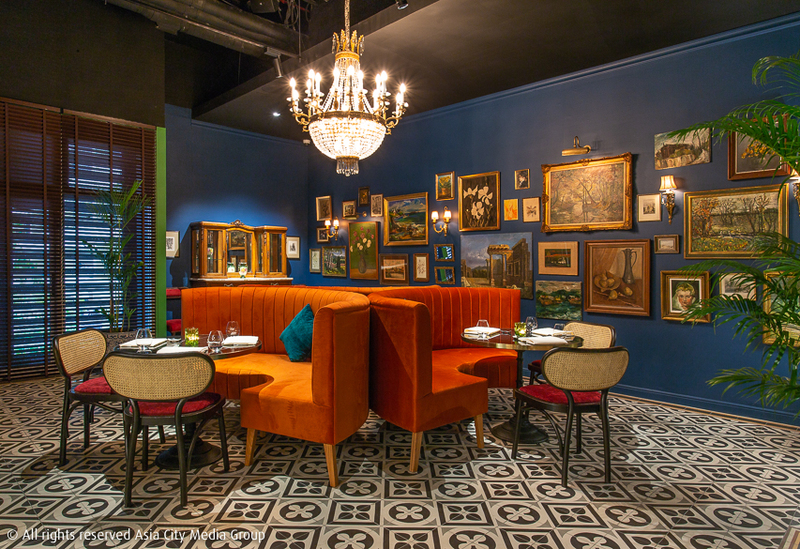 Sitting pretty above thriving Latin-themed party spot Revolucion, Sathorn’s new Mexican makes no concessions to Tex-Mex flavors. Made under the watchful eye of Mexican chef Sergio Velazquez, the tortillas are deliciously pliable yet sturdy enough to hold the pile of steak confit and guacamole in the Tacos Suaderos (B120). The Ceviche Acapulco (B220) tastes as if it’s been plucked fresh from the Pacific coast. 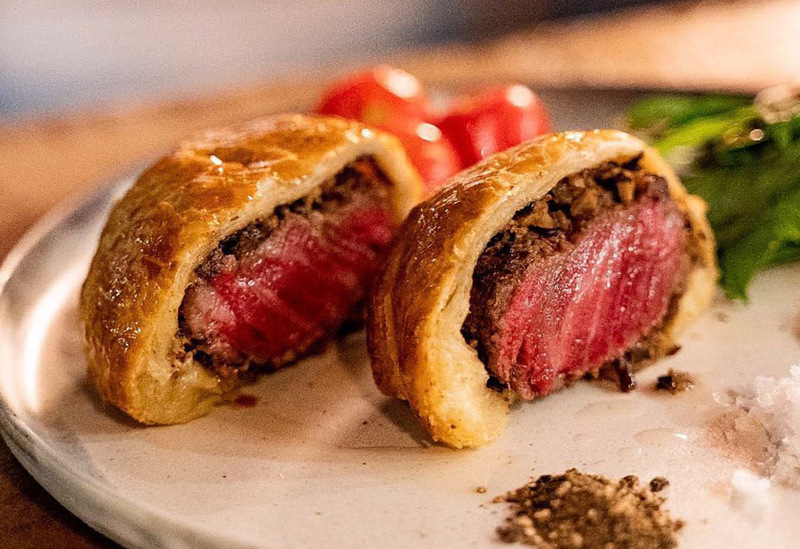 Meat, especially game, is the star of this glossy, upscale hunting lodge lookalike. Start off with a hand-cut steak tartare (B340) or chicken liver pate (B260) with marmalade and fresh orange. Seasoned with a hint of cumin and cinnamon, the wild boar meatballs (B420) make a hefty meal, served in a cast-iron skillet with a creamy sage sauce. Gaggan Anand, four-time winner of Asia’s 50 Best Restaurants, partners with his long-time buddy Takeshi Fukushima (of La Maison de la Nature Goh in Fukuoka, Japan) to open a fine-dining restaurant where every course is about tofu: tofu with ultra-tender slithers of Kobe beef rib-eye served suki style in a rich onion soup; tofu with a fillet of sticky-sweet kinki fish; wobbling cubes of sesame-rich mochi tofu; tofu “blancmange” with a shot of espresso; tofu milk dashi served with somen noodles. 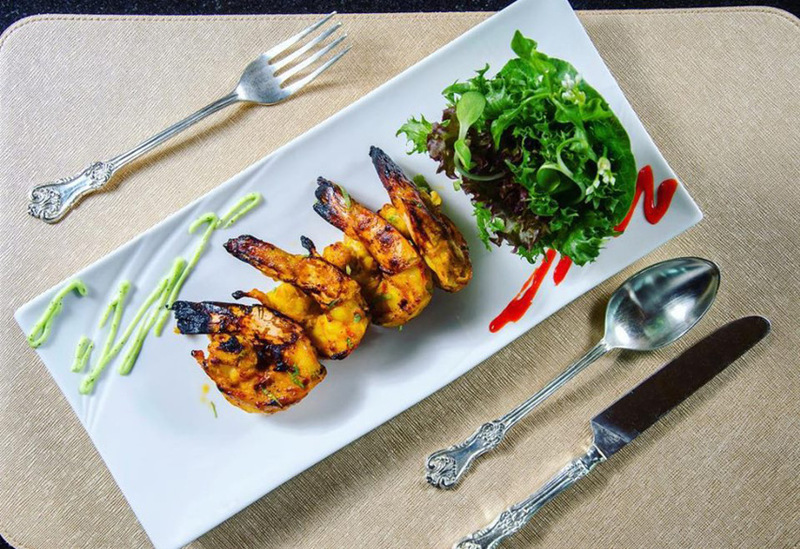 The entire experience plays out over 16 courses at a cost of B4,900. 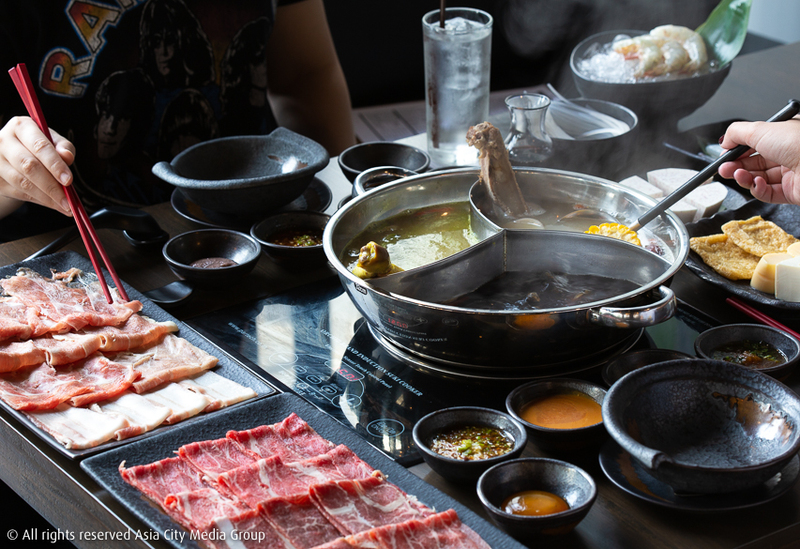 Chef-owners Randy Noprapa and Chalee Kader add to their burgeoning portfolios (together they’re responsible for Fillets, Surface and 100 Mahaseth) with this vibrant hot-pot restaurant. The soup comes in three flavor-packed varieties: a hearty pork bone stock bursting with peppercorn; a rich Japanese nabe with red wine; and a herbaceous chicken turmeric broth. Add some thinly sliced pork (B280 for mixed pork set) and beef (B520 for mixed beef set) to the steaming pot and you’re in business. This elegant Mughal-style dining hall spans Indian and Mediterranean cuisine, but the former provides most of the highlights, whether a comforting rogan josh (tender lamb stew, B475) or saag paneer (cubed cheese in smooth spinach sauce, B320) that’s asking to be dipped into with some garlic naan bread (B140). Fruity cocktails come in at B280. 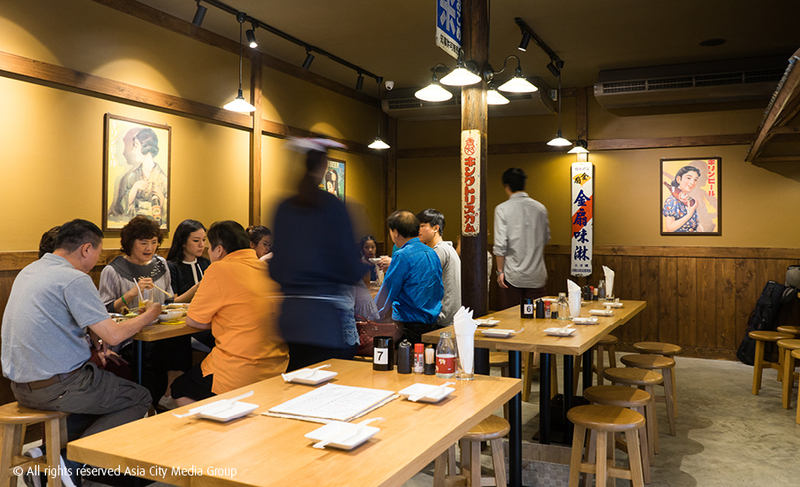 Sukhumvit Soi 26’s Nihon Saiseisakaba is all about Japanese-style nose-to-tail dining. This Tokyo-hailing izakaya with some 20 branches across Japan, Hong Kong and Taiwan specializes in motsuyaki, or grilled offal, with prices starting at just B29. That could mean pork liver topped with sauteed garlic and onion or succulent beef tongue. Chef Francesco Lenzi’s follow-up to Lenzi Tuscan Kitchen does away with the starched tablecloths and goes for wholesome Italian fare. The main draw is the pizza (from B280), whose light 72-hour fermented dough results in a chewy crust with just the right amount of charring. When it comes to pasta, the tagliatelle al cinghiale (B520) hits all the right notes with its rich, meaty wild boar ragu sauce and al dente ribbons of perfection. Think Beyond, the group behind Roast and Roots, have expanded to Sathorn with an altogether more-refined restaurant. 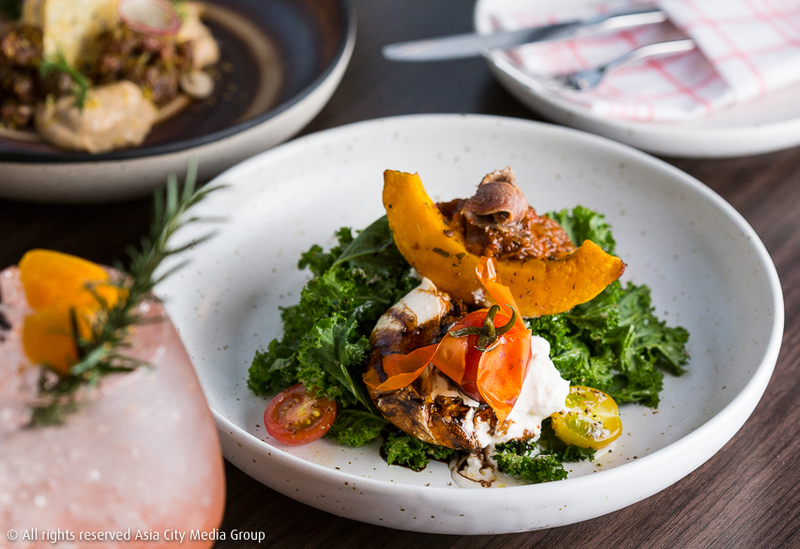 Chef Johnny Liu guides you around his small plates and sharing portions with a five-course menu that goes from familiar but dressed up squid ink pastas and Cubano sandwiches to creative, flavor-packed veg dishes and hearty grilled meats. The beef tartare in nduja aioli (B420) and grilled eggplant with cashew butter (B320) are essential eating. 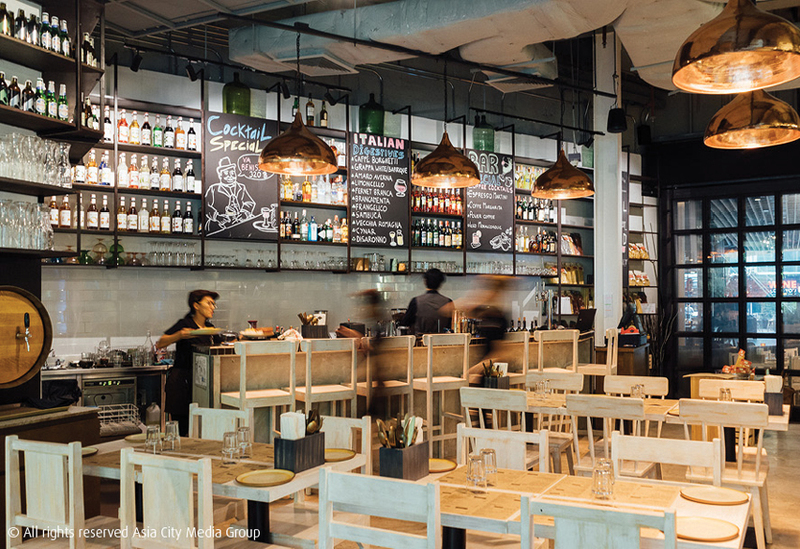 Gavin Vongkusolkit, of Glowfish and Kuppa Deli, blends Aussie bistro culture with the buzzing vibe of high-end Bangkok in this new venture for Phrom Phong. Live bands play nightly as guests enjoy pasta carbonara (B375), Ohira beef wellington (B1,645) and small-plate pizzas (from B375). With its warm woods, midnight blues, open kitchen and casual seating, this is Kuppa for 2018. Pizzeria Mazzie doles out those large hand-tossed, thin-crust pies you find in New York. The owners, genuine New Yorkers, have gone for a laidback bar vibe to match the pizzas they whip out of a custom-made “low-dome” Acunto oven from Naples. 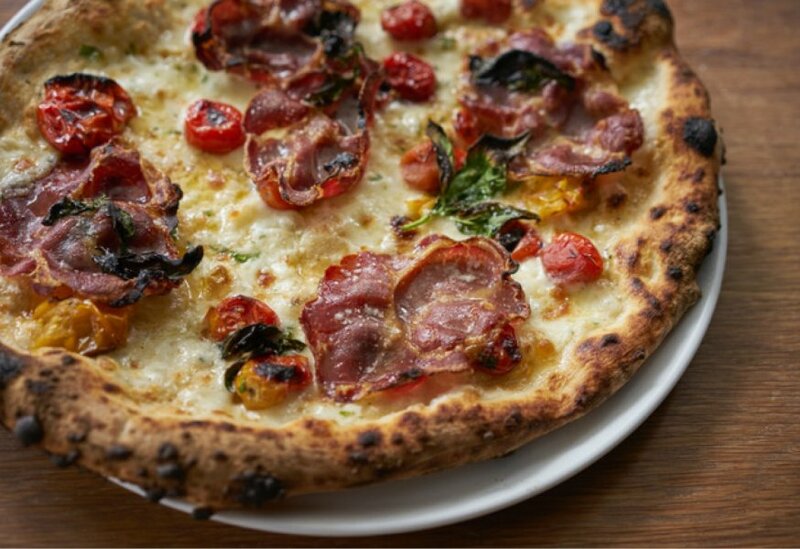 The dough, handmade with only four ingredients, gives you a crisp yet pliable base for options like the Hot Hipster (B510), topped with molten fior di latte mozzarella, spicy Calabrian salami, hot honey, chili, pecorino and basil. 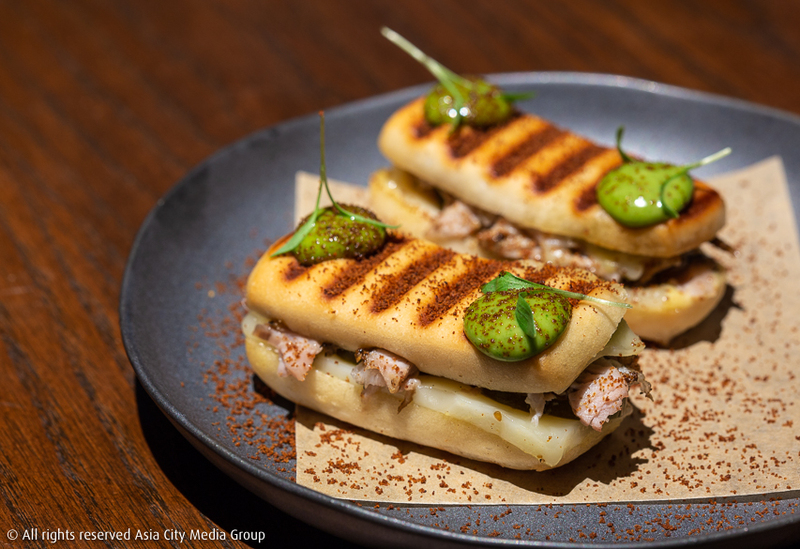 Rama 9’s steakhouse shows off chef Yakup Tangsongsirisak’s experience cooking under top American chefs Rick Bayless (Chicago’s Frontera Grill) and Alex Stupak (New York’s Empellon). The herb-crusted lamb rack (B690) is tender and perfectly accompanied by the baba ganoush, parmesan and cacik (a Turkish yogurt dip). The smoked short ribs (B590) are rubbed in a spice mix and grilled to smokey perfection. There’s also a personal touch here that sets it apart from so many other meat specialists opened lately. The new Thai fine-dining operation from celebrity chef Chumpol Jangprai is all about seasonal ingredients in a traditional setting reminiscent of the early Rattanakosin era. Choose between three set menus: Samrub Tri (B2,212), featuring charcoal-grilled chicken with chili sauce; Samrub Tho (B2,412), which offers hard-to-find dishes like coconut-smoked pork sausage served with ground fish, roasted rice and coconut milk; and Samrub Eak (B2,612), which highlights royal Thai cuisine. 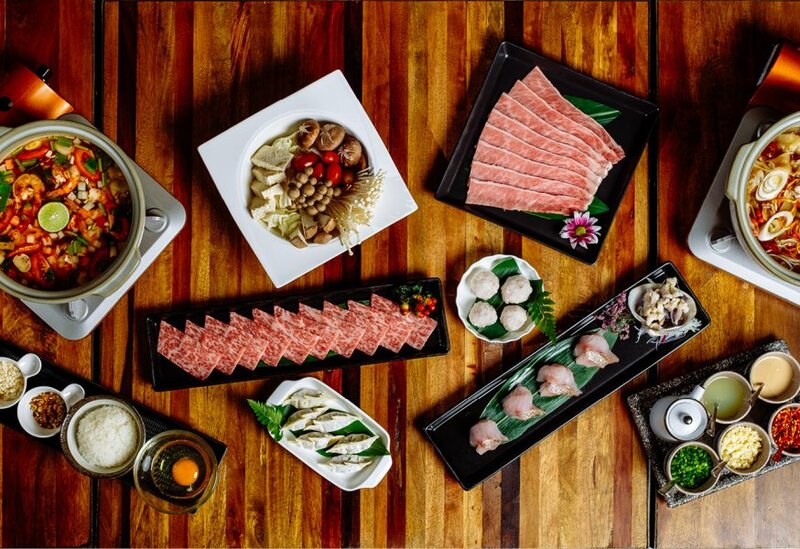 Hailing from the snowy fields of Niseko, Hokkaido, Ryunabe offers Cantonese-Japanese hot-pots of seriously premium meats and seafood. Budget B5,200 for the two-person all-you can-eat set up to B9,800 for four. Soups span Chinese dried fish maw and chicken simmered for over 36 hours to the Thai-indebted tom yum seafood stew. Proteins include Japanese wagyu beef and Spanish Iberico pork, dumplings, as well as fresh prawn, crab, sea urchin and oysters. Head chef Sujira “Aom” Pongmorn reinvents fermented beef salads, crab fat dips, grilled pork neck and spicy-sour soups as delicate tasting portions that compete with the top tier of Bangkok fine dining. 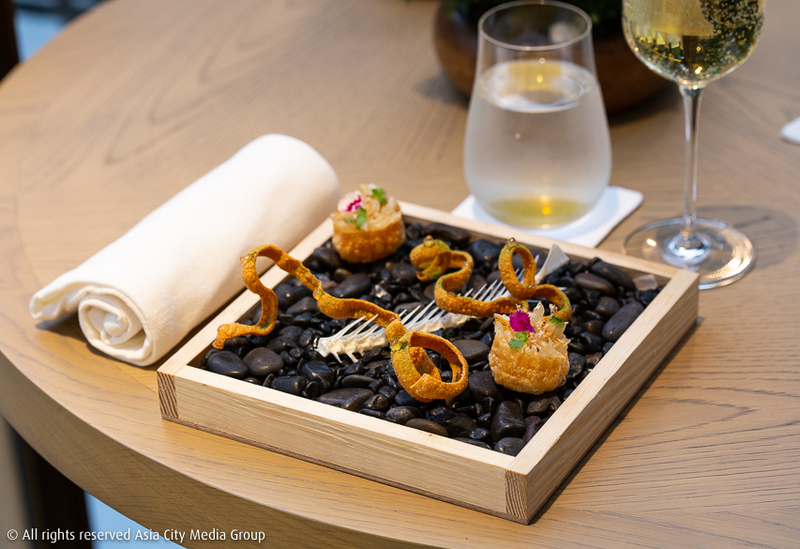 For the fixed price of B1,950, the moodily-lit, glamorously appointed restaurant serves only tasting menus, best augmented with the superb wine pairing (B2,350). A new and more central incarnation of Changchui’s popular Raan Nye Sohn, Sonny’s is making a stir on Charoenkrung Road for its well-executed and affordable French cuisine. The unpretentious interiors—checkered tablecloths and net curtains—match the gimmick-free, ever-changing chalkboard menu starring dishes like beef bourguignon (B480) and creme brulee (B160), with a heavy focus on local ingredients. If you’re lucky, you may even catch the eponymous chef, owner and member of blues band Sleepy Eye Slim busting out some tunes. Baan Ice founder Supaksorn Jongsiri’s five-course sharing menus (B2,900) are causing a hi-so sensation thanks to bold flavors, traditional techniques—fermentation, coconut milk squeezed on-site daily—and a decadent, exclusive dining room. The fish is lightly charcoal-grilled for a touch of smoky flavor, and the soup is stewed for hours with specially selected beef-bones, before being combined with grilled vegetables. Does it really need to be this fussy? Perhaps not, but the result is dishes that truly nourish the soul. Perched 25 floors above Siam, this ambitious Thai restaurant bills itself as “hyper-local” in reference to the seasonal ingredients it sources from independent farmers around the country. Monthep Kamolsilp, the 29-year-old executive chef, offers both a nine-course tasting menu (B1,800) and a la carte. Firm, juicy brackish prawns from Ranong and their roe star in the choo chee curry (B390) with basil-wrapped grilled eggplant. The pad kaprao (B410) is made with organic pork from Nan, as well as long beans, torch-ginger and southern budu fish sauce. Chef Andy Yang, whose Thai restaurant Rhong-Tiam won a Michelin star in New York back in 2009, is behind this very exclusive, very swanky chef’s table. Choose between eight or 12 courses (B2,900 or B4,900 per person, minimum of four people). 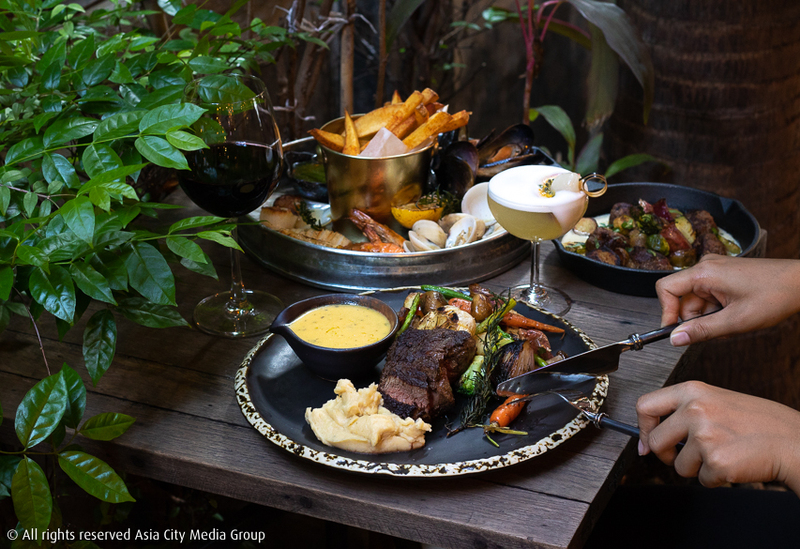 The Beef Green Curry is a thick cut of buttery Grade-12 marbling wagyu from Ozaki (“the otoro of the land”), while the Massaman Lamb and Duck Gang Phet are similarly flavorful exercises in deconstruction amid the Massimo Bottura-meets-Dexter splashes and splatters. 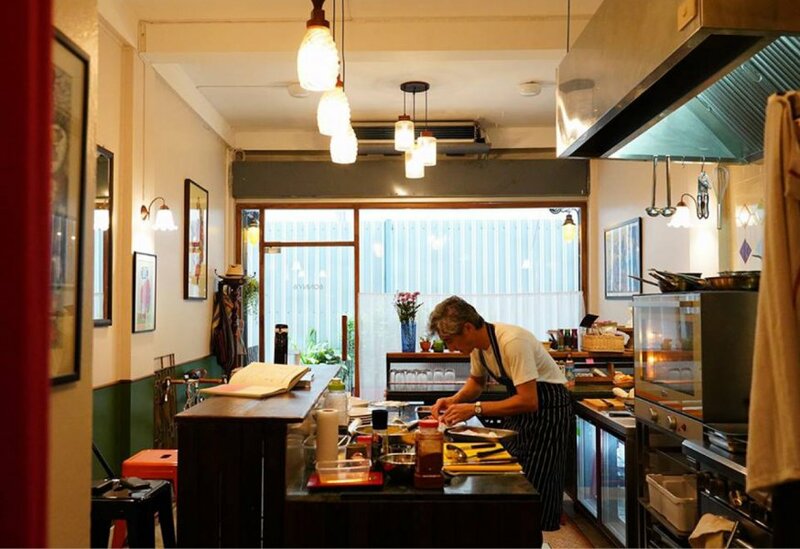 Serving Japanese food with a French twist, Tenshino feels like walking into the home from Royal Tenenbaums. 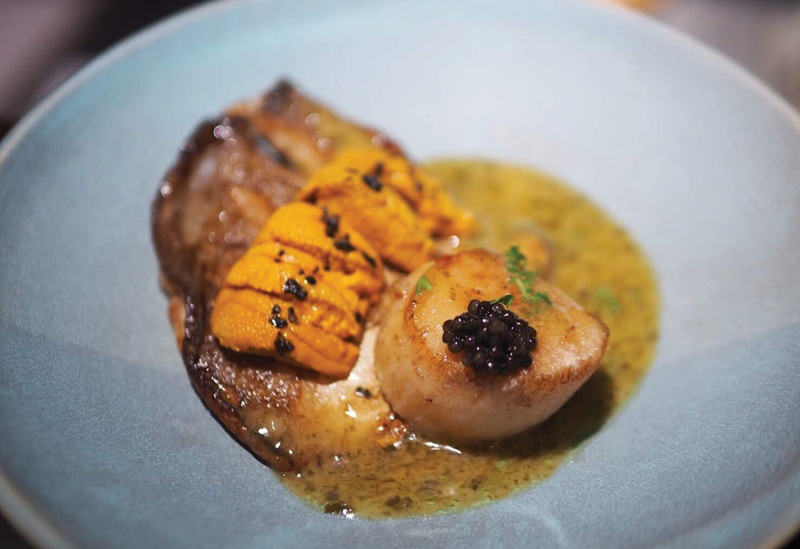 Head chef Yohei Okita’s cuisine is as eclectic as the decor, ranging from authentic sushi (B1,240) and wagyu beef saki (B1,870) to poached Perigord foie gras (B550) served with round discs of tender pumpkin, red beans and a delicate ginger broth. Sukhumvit Soi 31’s Thaan is all about Thai natural charcoal and meat from farms in Korat, Surin and Surat Thani. The Crying Tiger’s (B300) thinly sliced Thai wagyu is served with an addictively spicy jaew, while select imports like the Australian wagyu tomahawk (B500/100g) paired with a decadent foie gras mac and cheese (B390) make for the main event. Owner Ishikawa Motonobu is a third-generation fish wholesaler who runs a restaurant in the outer market of Tokyo’s Tsukiji Fish Market. 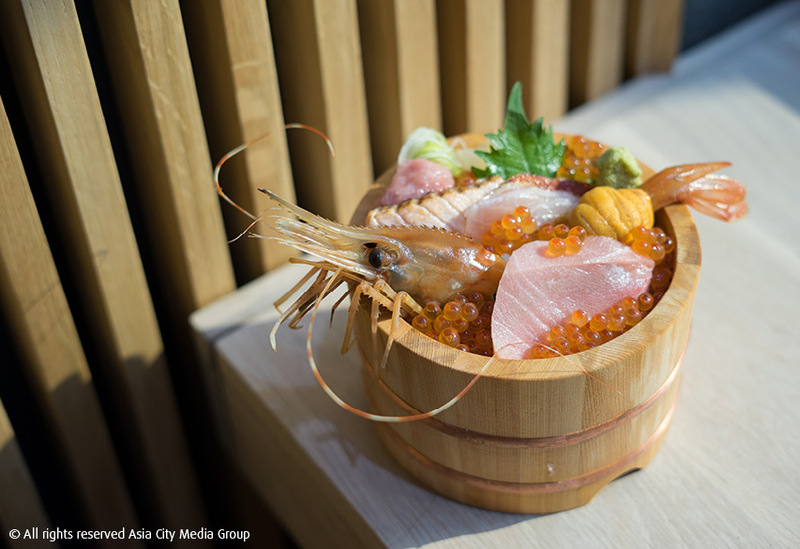 This Bangkok operation is a 12-seat bar where chefs work with a quiet confidence that disguises the sophistication of the sushi, which comes in the form of omakase sets and a la carte pieces. 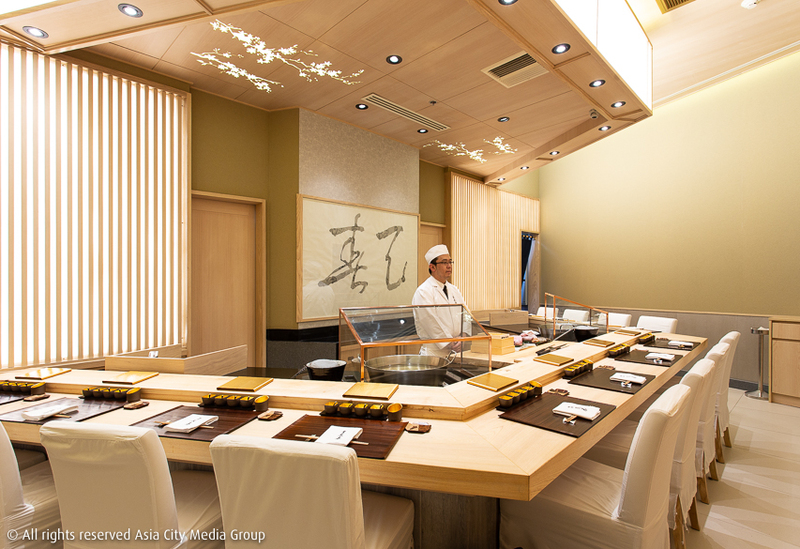 At B3,300 for the dinner set, it’s also a lot more affordable than many omakase specialists. The Umbria-headquartered Urbani Tartufi boasts of being the world’s number-one truffle dealer. 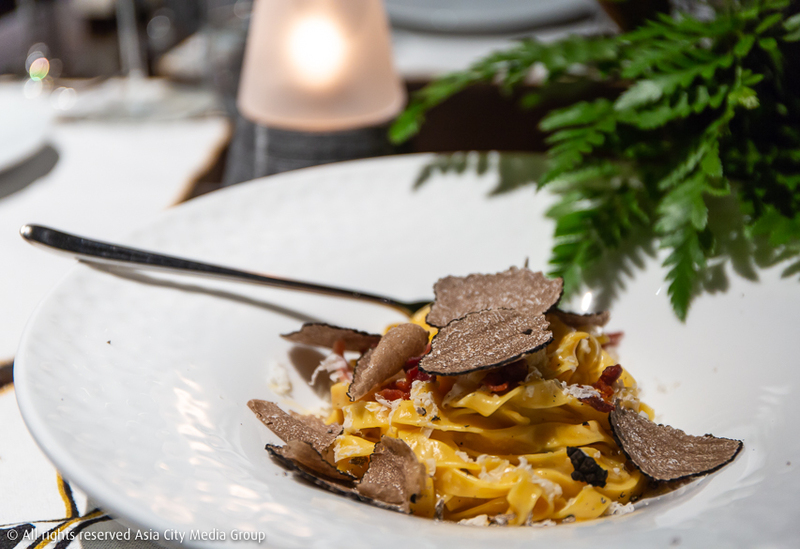 Now it’s in Bangkok atop Sathorn Square building in the form of a fine-dining restaurant where two set dinner menus (B3,900 for five courses/B5,500 for seven courses) burst with truffles from almost two-thirds of their dishes. The agnolotti al tartufo provides the most outstanding example of how delicious this delicacy really can be—fresh homemade pasta parcels, filled with a mouth-wateringly rich truffled wagyu beef ragout, topped off with creamy bearnaise sauce. Here, three of the 2018’s standout chefs give us the juice on their favorite new spots to eat in the city. 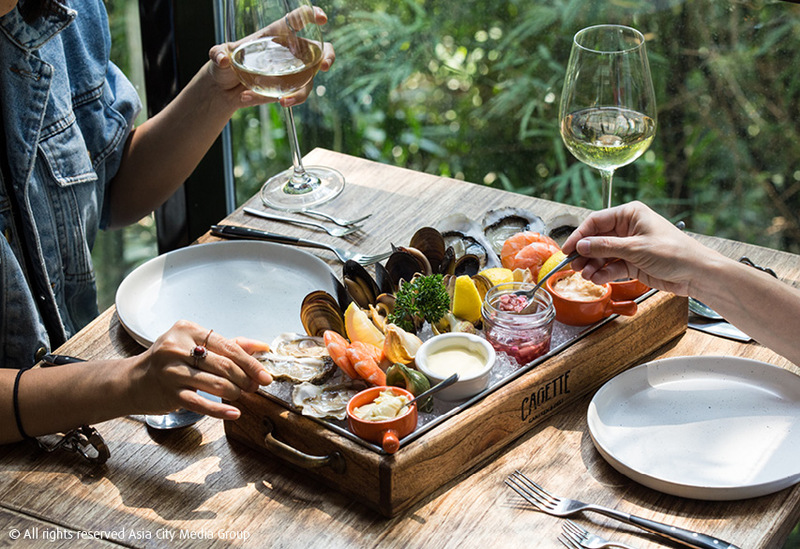 We can spot at least 18 names in this year’s best new restaurants that have a chance of making it into Top Tables 2019, BK Magazine’s guide to Bangkok’s 100 best fine-dining restaurants. We’d say that Sorn, R-Haan, The Front Room and Saawaan are all headed near the top, which could make for some interesting shake-ups in the already tightly contested Top 30. Then there’s Mihara Tofuten, the new restaurant from Gaggan, to contend with as well. But Top Tables is not all about tasting menus. Funky Lam, Aesop’s and Cagette are our casual standouts of the year. And never overlook the Japanese. 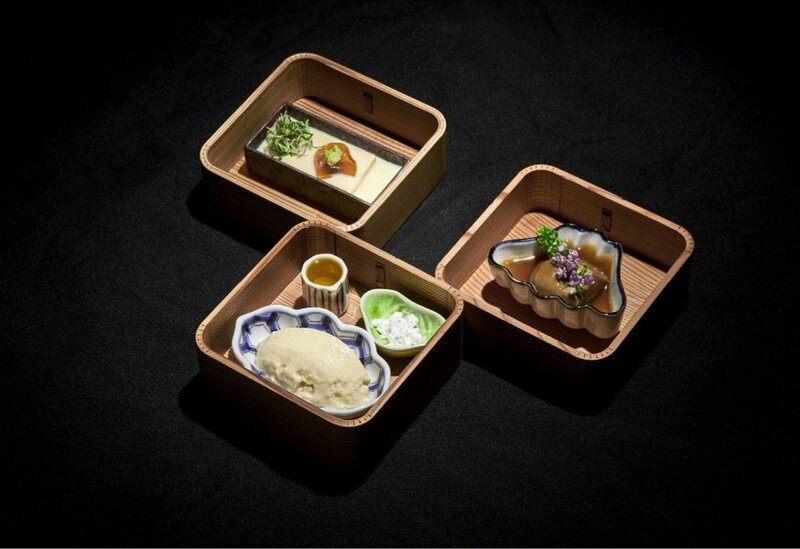 The ultra-indulgent tempura omakase of Ginza Tenharu has surely got to stand more than a chance of placing. Don’t miss the guide when it comes out with the March 29, 2019, issue of BK Magazine. 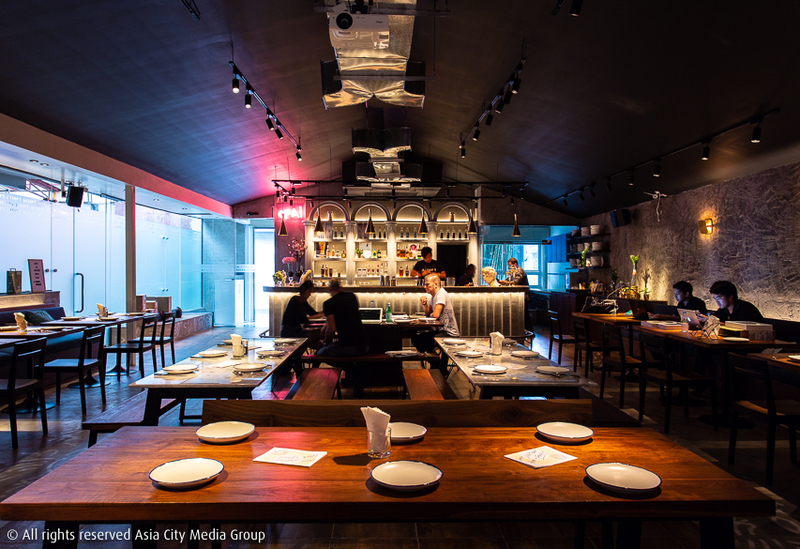 Top Tables is Bangkok’s only fully independent ranking of Bangkok’s best restaurants. Every year, we put together a panel of judges (sorry, their names are private) who know the Bangkok dining scene inside out to rate their favorite restaurants in the city. Only the top 100 make it, with no concessions to advertisers or sponsors’ venues. Read exactly how we make sure Top Tables remains Bangkok’s most trusted and independent restaurant ranking (and check out the winners from 2018) at bktoptables.com.